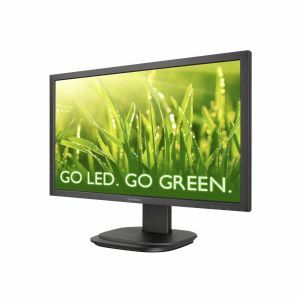 ViewSonic VG2239m-LED - LED monitor - 22"
The VG2239m series widescreen monitor is one of two members of ViewSonic's VG39 family. Its 22" display with a native 1920 x 1080 resolution is big enough to replace dual monitor setups. What makes it even more appealing is the LED backlight for up to 50% energy savings. Monitor is also fully ergonomic with 90� pivot, height adjust, swivel and tilt. The slim bezel design coupled with hidden stereo speakers make the VG2239m a space saver. The VG2239m-LED features DisplayPort, DVI-D digital, and a VGA analog input. You can connect multiple sources at the same time and then toggle between them by selecting the input source through the On-Screen-Display (OSD). You can also connect one of your computer's USB ports to the monitor's USB uplink input which then multiplies the USB ports to two. This way, you can connect your keyboard / mouse or other peripherals to your monitor directly and save yourself from the hassle of reaching for your computer's USB ports.